The LG G7+ThinQ brings HDR video, audiophile-grade hardware, IP68 rating and a body designed to withstand damage from being dropped. You get all this for a very reasonable price, and while it looks to be a very lucrative proposition, it isn’t a perfect smartphone. Every year, we’ve seen flagship smartphones only get more expensive. While at times this hike in the price tag could be attributed to inflation, there have been times where the price hike was just to elevate the premium status of a device. Then there are phones like the OnePlus 6 and the Asus Zenfone 5z which offer top of the line hardware but cut very subtle corners to justify the lower price tag. Enter the LG G7+ ThinQ, which is priced just a smidge higher than the OnePlus 6, comes packing all the flagship features you’d expect and doesn’t seem to be cutting any corners either. All of this sounds great on paper, but we’ve learned that if something sounds too good to be true, it usually is. To separate fact from fiction, our review unit of the LG G7+ ThinQ was put through our testing process and here is how it fared. The LG G7+ ThinQ brandishes the very familiar glass sandwich design, but instead of resembling the LG G6, it more closely resembles the LG V30+. The front and back are both protected by Gorilla Glass 5, held together by an adequately broad metal frame. The review unit we tested is the Astro Black variant, so in terms of its looks, it's completely discreet. There are no dual ton finishes or fancy streaks of light here. All you get is a black glass back which will collect fingerprints very easily. The camera is now mounted vertically dead in the centre instead of being horizontal and just below it, sits the fingerprint sensor. Interestingly, the fingerprint sensor no longer doubles up as a home button, but I guess that’s a good thing since its one less mechanical part you don’t have to worry about failing. Moving over to the sides, the right side houses the power button while the left has the volume buttons and a dedicated Google Assistant button. In my use, I found myself accidentally pressing the Google Assistant button quite often, so I’m guessing this is something that will take something a little getting used to. It's not too bad though since you can disable the button altogether, although it would have been great if we could reconfigure it to fire up the camera or take a screenshot or something. The LG G7+ ThinQ takes design cues from both the LG G6, which had a more ‘industrial’ build and even the LG V30, which was more curvaceous and elegant. Overall, the LG G7+ ThinQ feels really good in the hands. The all-glass design is very elegant and the absence of curves for the screen makes it far easier to use with one hand than those with curved displays. What really sets the LG G7+ ThinQ apart from all flagships under Rs 40,000 is the fact that not only is it IP68 rated, but also comes with MIL-STD 810G rating, making it durable enough to withstand drops waist height. This is one of the many corners other smartphone manufacturers cut in order to keep their prices low, but the LG G7+ ThinQ doesn’t. What you will, however, find disappointing is the lack of a TPU case bundled in the box. One could assume that LG didn’t feel the need to put one in them since their phones are so “tough,” but the simple truth of the matter is, if its made of glass, it can break. After a lacklustre reception of the POLED display on the LG V30+ and even the Google Pixel 2 XL, LG has decided to go back to IPS-LCD for their smartphones. The LG G7+ThinQ sports a 6.1-inch display with a 19.5:9 aspect ratio. The display has a resolution of 1440x3120 putting the pixel density of the display at roughly 564 PPI. Where things get really interesting is with the fact that the G7’s display offers 100 percent DCI-P3 coverage. The display also supports both Dolby Vision and HDR10, meaning you will be able to stream your favourite shows in HDR onto the phone. Typically, these features are reserved for more expensive phones, but LG brings them to a relatively more affordable price point. The LG G7+Thinq’s display gets REALLY bright, with LG claiming it goes all the way to 1000nits. This, it does, but only when viewing HDR content (since that’s a requirement). In day-to-day usage, you can crank the display to a super bright 825 lux for outdoor ease of use and when in bed at night, the display goes down all the way to 3 lux. Using the LG G7+ThinQ was great both outdoors and indoors. However, there were some issues when I tried looking at the photos I had shot with the phone while outdoors. When looking at the phone head-on, the display is adequately bright, and the reflections are hardly there. However, if the viewing angle shifts more than 20 degrees, the display starts becoming very reflective. Watching HDR content on the LG G7+ThinQ was probably the best viewing experience I’ve had on a smartphone for the longest time. 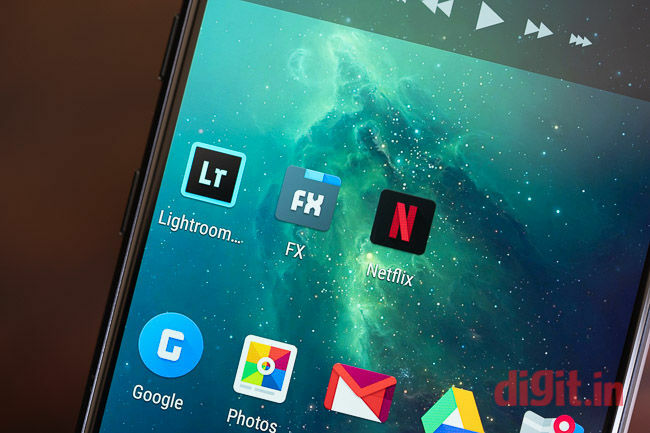 The LG G7+ is on Netflix’s list of supported smartphones for HDR streaming, but not on the list of phones that are Dolby Vision compatible. I started with the first episode of Altered Carbon just to see how good the content would look on the display and ended up watching the entire season all over again during this review. If anything, the LG G7+ ThinQ makes a great case for upgrading to a 4K HDR TV. The LG G7+ brings a superior, more mature display from the premium flagship range into the sub-40K price segment. Both the OnePlus 6 and the Asus Zenfone 5z offer FHD+ displays and are rather good, but the LG G7+ ThinQ breaks the rules of not giving premium displays at nominal price points. The LG G7+ ThinQ is powered by a Qualcomm Snapdragon 845 mated to 6GB of LPDDR4 RAM. There’s 128GB of onboard storage which can be expanded by the use of a MicroSD card. I’ve got a 64GB Sandisk Ultra card in the LG G7+ which houses a bunch of movies and roughly 25GB of FLAC files. Since this smartphone is also about audiophile grade music playback, it would be a crime to not test the phone with the highest quality audio files out there. First, let's start with the benchmark numbers. The LG G7+ ThinQ performed admirably, scoring very similar numbers to the OnePlus 6, Asus Zenfone 5z and the more expensive Samsung Galaxy S9+. 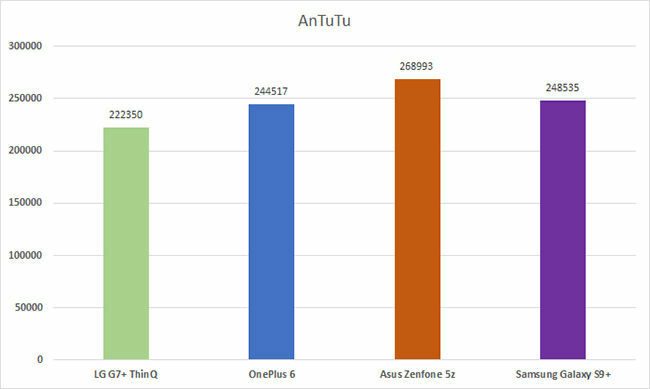 On Antutu, the LG G7+ scored 222350 while the OnePlus 6 scored 244517 and the Asus Zenfone 5z scored 268993. 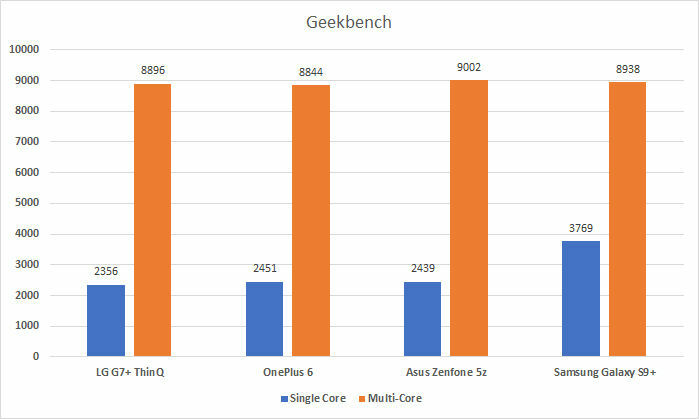 On Geekbench Single and Multi-Core tests, the LG G7+ gets 2356 and 8896 respectively. You can see a graph below that details the scores of the four most popular phones in the flagship segment, showing that the LG G7+ fits beautifully within this segment, without letting performance take a hit due to the heavily customised OS. Moving over to the daily life experience, the LG G7+ did not disappoint in any arena. My use of the phone can be pretty gruelling between editing photos shot in RAW mode using Adobe Lightroom and playing demanding games like Asphalt 9, Modern Combat 5 and Injustice 2. As expected, the phone handled gaming flawlessly, with no drop in frames in any of the above-mentioned games. The phone does get noticeably hot on the top half of the phone, around the camera module. This isn’t anything to be alarmed about as phones with glass design do tend to heat up a little. The phone will cool down to normal room temperature within a few minutes of you ending your gaming session. While editing RAW files in Lightroom (and even Snapseed), there was no lag between moving a slider and its impact on the photo. Previews were generated instantaneously and image export at the highest resolution only took a few seconds. When it comes to simpler tasks like browsing the web or just using the phone without closing background apps, the LG G7+ ThinQ doesn’t falter there either. It can easily handle Chrome with 30+ tabs, multiple games and photo editing apps all open simultaneously in the background, without making the active app feel slow or sluggish. As you would expect from a smartphone running the Snapdragon 845 chipset and 6GB of RAM, the LG G7+ThinQ leaves little to no complaints when it comes to performance, but we’re going to have to see over the next few months whether the performance takes a hit due to the OS or not. The LG G7+ ThinQ comes with Android Oreo 8.0 right out of the box. However, this isn’t stock Android. The phone is running LG’s own, heavily customised version of Google’s smartphone operating system. LG’s UX has been something that the company has spent a lot of time experimenting with, all the way from the days of the LG V10. For the display, LG is calling the notch a “second screen” although its true nature remains that of a notch. 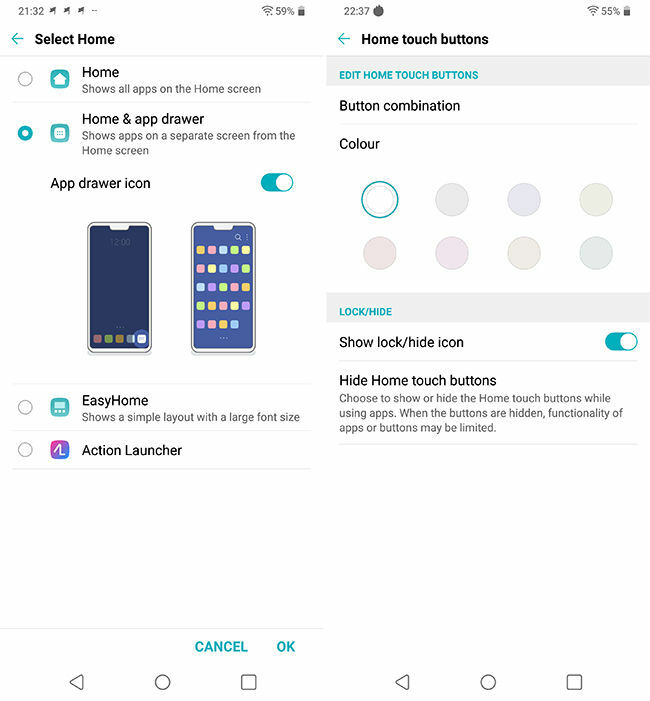 However, if you do decide to disable it, you do have the option of also setting up some interesting colours and patterns to fill up the notch area. The software also allows you to tweak the display in rather intricate detail. Besides being able to set a custom white balance, one can also fine-tune the amount of Red, Green and Blue colours individually. While the stock home screen is set up to be like that of the iPhone, you do have the option to use an app-drawer. The OS also supports custom themes and icons, but they must be downloaded from LG’s own store. If you download icon packs from Google’s Play Store, you will need a custom launcher to apply them. Overall, LG’s OS has been customised rather beautifully for the LG G7+ ThinQ, accounting for the notch and the fact that an IPS display should be easily tweakable. Besides that, you still get the standard LG features like the floating menu. If you’re a seasoned LG user, you will be all too familiar with the segregated, multi-page system menu which is “neatly” broken into four key segments; Network, Sound, Display and General. The reason for this segregation is the amount of customisability the OS has to offer. However, the downside is that new-comers may find it a little too daunting to navigate. While people may not be familiar with LG’s own UI, most people are generally aware of how system menus are generally organized in Android, and LG’s is a FAR departure from it. Thankfully, there’s a convenient search function at the top and suggestions at the bottom to help you find whatever you need, easily. Overall, LG’s UX for the LG G7+ThinQ is very functional and doesn’t hamper the performance of the smartphone itself…at least for now. Also given that Android P has finally been released, LG’s success with the G7+ will truly rely on how long it takes for the company to update the OS, and also how many improvements it issues to the smartphone via OTA updates. For now, there’s very little to dislike here. LG continues to stick to its guns when it comes to dual cameras. We get a wide angle and an ultra-wide angle lens for the rear cameras. While both the imaging sensors sport 16 Megapixel resolution, the wide angle lens offers an aperture of f/1.6 and the ultra wide angle lens has an aperture of f/1.9. The former lens has optical image stabilization while the latter doesn’t, but that’s okay. As far as hardware goes, LG has a pretty decent set on the camera, and it offers a ton of features to capitalize on them. 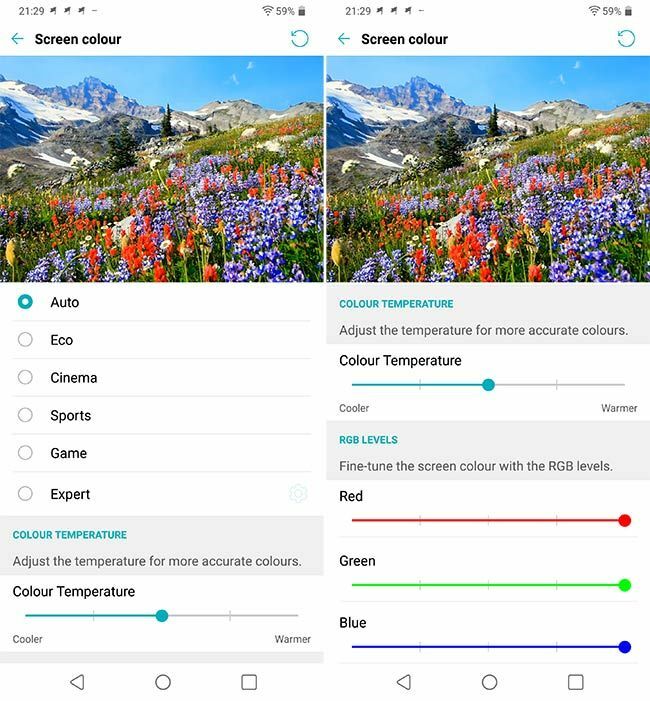 For photography, you get an auto-mode augmented by LG’s ThinQ AI. 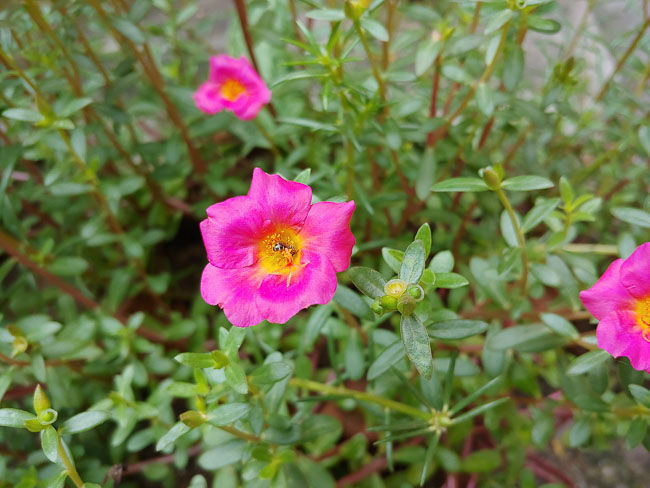 Photos out of the LG G7+ThinQ look very good on the display, nice vibrant colours, good dynamic range, but once the photos were proofed on a colour calibrated display, a whole different story emerged. Most of the shots (regardless of the lens they were shot on) were lacking in sharpness, especially towards the edges. It was also surprising to note the lack of detail in photos that had been shot in good light. 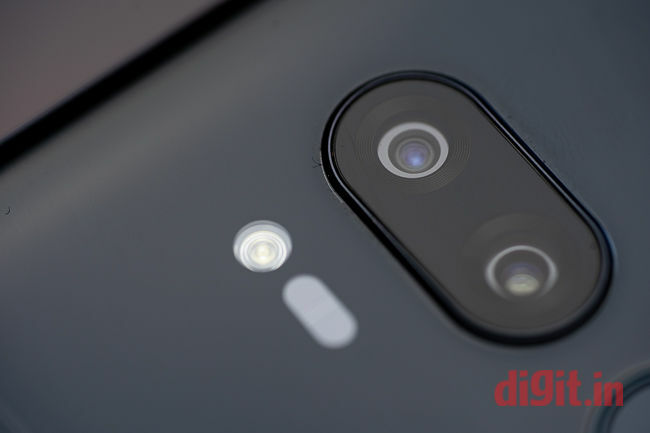 For those who would be looking to print their photos, the LG G7+ would be a phone in dire need of a major software update to improve the imaging algorithms. Switching over to the Pro mode allows you to shoot in RAW mode, which does away with many of the problems introduced in the Auto mode. RAW files retain all the native detail of the sensor. The icing on the cake is that LG’s software allows you to get RAW output from the secondary, ultra-wide sensor as well. This is something that no other smartphone manufacturer offers at the moment, mostly because the secondary camera usually employs more software tricks to deliver the output than actual precise optics. Bottomline, for now, the LG G7+ThinQ delivers good performance only in Pro mode and desperately needs an update for the auto mode. 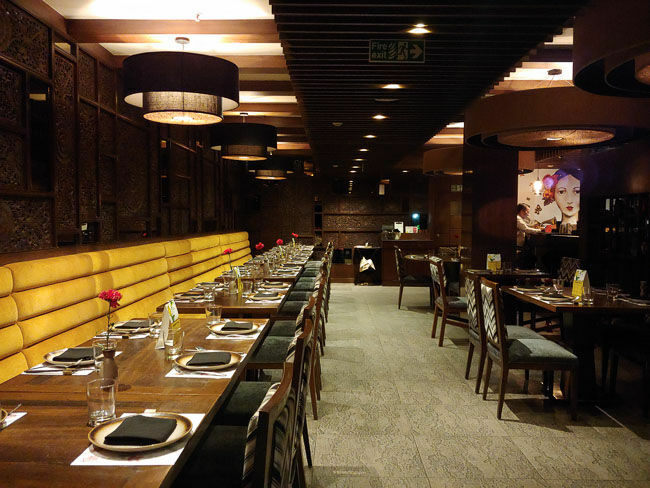 The same behaviour also translates over to low light photos. Standard JPG files suffer from aggressive noise reduction, making them completely devoid of any detail. The large f/1.6 aperture on the main camera helps keep the camera from spiking the ISO quickly. Unfortunately, shooting RAW in this situation doesn’t particularly help as RAW files come with plenty of noise (since the JPG algo isn’t filtering it out) and putting the RAW files through noise reduction in the desktop version of Adobe Lightroom wasn’t able to rid the noise without destroying the detail in the photos. Let’s talk about video for a short moment. LG offers manual mode for video recording, but that’s been around since the G6. What’s new with the G7 is the fact that it can shoot HDR10 compliant video at 1080p (30fps). The Sony Xperia XZ2 also offers 4K HDR video recording, but it costs almost double what the G7 does. The LG G7, at this point, is the cheapest way to shoot true HDR video, but there are some limitations. First, the ultra-wide-angle lens isn’t available when save as HDR10 is available. Second, the mode only allows a maximum resolution of 1080p at 30fps. Lastly, and probably most importantly, the video shot in HDR10 will not look like a colour burst of rainbows, but will instead look almost colourless, with little to no contrast. HDR10 videos require colour correction in an editing software to bring out their wide colour gamut and increase their dynamic range. The last aspect of the LG G7+ThinQ’s imaging performance lies in its front-facing camera. You have a nice 8-megapixel f/1.9 shooter for all your selfie needs. Sadly, there’s no autofocus here, a feature that continues to remain exclusive to Samsung’s flagships. Here, you get three options while taking selfies; AR Filters to turn you into a princess of a cute kitten/dog. There are colour filters very similar to what we have on Instagram and lastly, a beautification setting to remove blemishes from the skin. It gets the job done, with images coming out a little over-saturated. 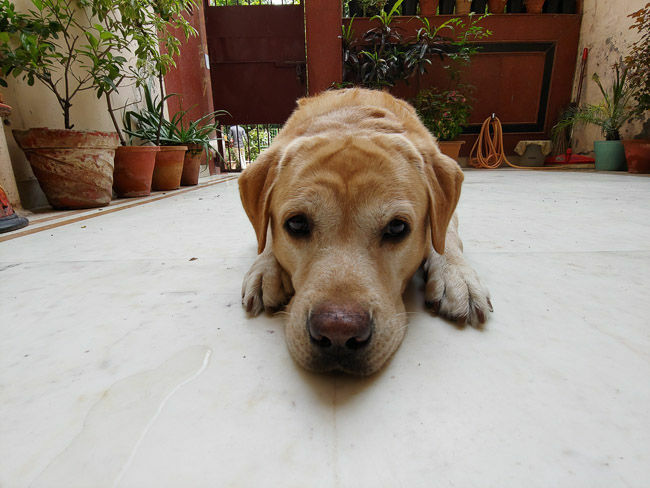 For social media enthusiasts, the camera should suffice. One of the biggest red flags for the LG G7+ThinQ is the relatively small 3000mAh battery in comparison to the much larger ones offered by the competition. On the PCMark 8 battery test, the phone lasted 6 hours and 3 minutes, which is surprisingly similar to the number we got from the OnePlus 6. In real life though, the LG G7+ThinQ just barely makes it through a busy workday. 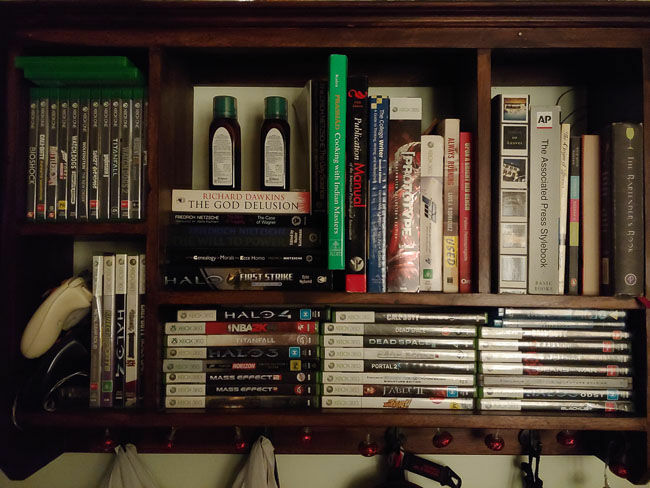 I play roughly 30-45 minutes of games every day but do watch a lot of Netflix. There’s also a lot of calling (roughly 3-4 hours a day) and of course, plenty of music playback over headphones and Bluetooth. By the end of the day, the phone was easily hitting the 8-10 percent mark. If you’re a worker bee, you shouldn’t worry too much about this since you can top up the battery thanks to fast charging and of course, wireless charging as well. On most days, you really won't have to worry about the battery life, but if you do have a post-work excursion planned, you may need to plan ahead for a top-up. Here’s a simple truth. The LG G7+ThinQ is a premium flagship smartphone that challenges the conventional thinking that a premium flagship has to come with a premium price tag. It also easily challenges the convention that low-cost flagships need to cut obvious corners when it comes to durability, display and even features. 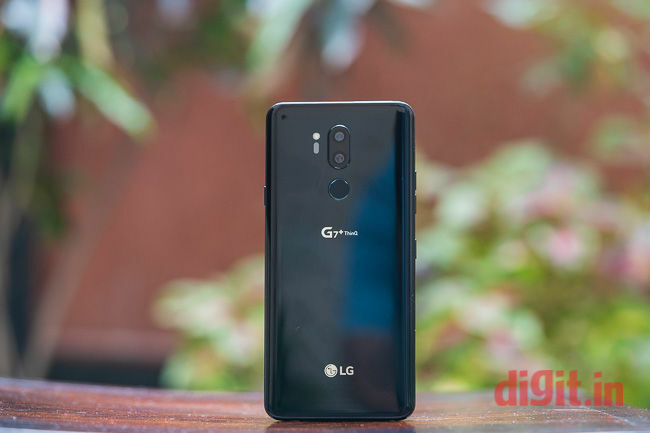 The LG G7+ThinQ with its price of Rs 39990 throws a spanner in multiple status quos and is a very viable alternative to the current reigning “flagship killer,” the OnePlus 6. The LG G7+ThinQ is great for gamers, audiophiles and hopefully even content creators who are willing to put some effort into editing. It’s a great phone for the price but is a success will depend on LG’s ability to continue improving the phone via software updates. should I go for Lg G3 or wait for one plus two flsgship? Vivo Xshot had best camera specs as compaerd to lg g4, iphone 6 or 6 plus, smasung s6.